Last week, we had a grand ol' time troubleshooting some issues, chatting about the player, making some new friends, and salivating over a Dark Chocolate Bacon Cupcakes recipe. So, we'll be holding office hours again next week, same bat time, same bat channel. Let us know if you'd prefer a different time for future office hours, or just post your questions in our discussion forum. Starting next week, we'll be hosting live office hours on IRC (irc.freenode.net channel #youtube-api). Come ask your questions, give feedback, gossip about the latest Atom Pub news, share best practices, or just hang out. If you can't make it, no worries, you can still post, as always, in the discussion forum. You can also let us know what times would work better for you in the future. See you there! UPDATE: Small change. We'll be hosting hours 1-3 PST, not PDT :) Also, for those of you who don't have IRC clients installed, you may want to use a web-based client like mibbit.com. Choose "Freenode" as the server, pick a nickname, and use #youtube-api as the channel. I wanted what I thought was a basic feature: using the embedded player to play 23 different YouTube videos in the same Flex app. I started with a straightforward implementation - using the SWFLoader Flex component with the source set to the URL of the YouTube video. But I noticed some funny behavior - the first video would load, but none after that. After some searching around, I discovered the reason for this: if the first loaded YouTube SWF isn't properly removed by calling its destroy method(), any subsequently loaded YouTube SWF won't play correctly. The solution is to call destroy() on the YouTube SWF - but wait a second, it's not that easy. 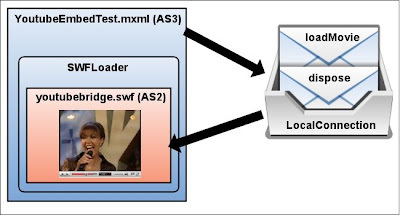 Flex/AS3 SWFs cannot call methods on AS2 SWFs, and YouTube SWFs are indeed written in AS2. After harassing various YouTube engineers and reading through the AS3 Chromeless Player wrapper code, I came up with the solution shown in the diagram below. The full code (MXML + FLA) is available, and you can test out the demo app. Now that I've made it easy for you all, I hope to see some nifty YouTube/Flex mashups.. and maybe even some Youtube/Flex/Maps mashups!